jang i would hate if they went with yellow green would be much better. I love this M.O.C. thanks for posting it. What LEGO should have done. I am telling you, you should apply for a job as a LEGO designer, JANG. Does the gun still shoot? I am just recommending that if you have seen the upcoming Nex (which you probably have), you should remake it and add a gun with a cordak blaster. Love Surge Revamp. I think that you should apply, because I am sure that the pay is great, and the current designers need some inspiration. Jang you should apply for a Lego designer it would be awesome. I would really like to by one of your sets. The other day i was looking to buy a bionicle from the local market, and i came across something horrible! This Japanese Company called Bela had ripped off Bionicle! I saw to Bionicles, Atakus and Tanma and they were called Invincibility Robot. I picked up the Tanma one. So diffrinces from the origional set. 1.Instead of "Bionicle Phantoka" it was "Invincibility Robot". 2.The inside of Tanma's Kanohi(Noble Miru)was white. 3.The only thing awesome about this set: Translucent sockets, in black! 4.On the back of the box it said "Building Block series". 5.And finally all the pieces had their lego marking removed and were remodeled a bit. If anyone else has noticed this, please comment. You should make a revamp of Evo! Invincibility Robots have been around for a long time. There are actually a lot of ripoffs like this. Off the top of my head I can only think of Maskers, Kapar, and Berserkers, but there were a lot more. 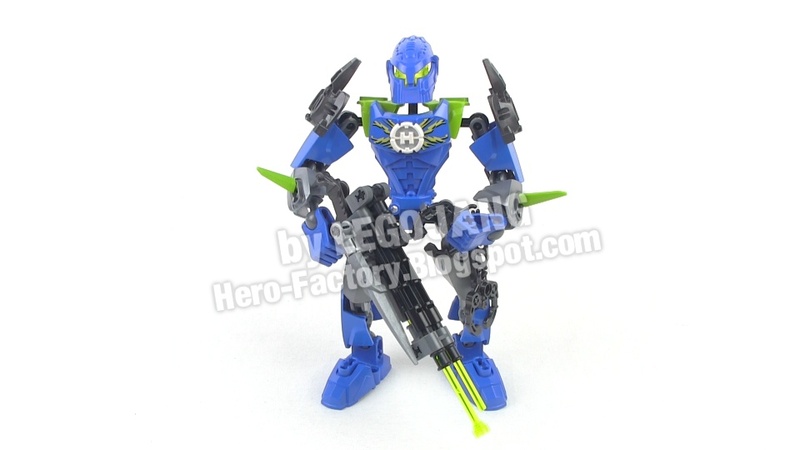 I've provided a link to somebody's Brickshelf gallery that catalogues Bionicle ripoffs. What's interesting is that sometimes they recolor parts- I've seen a dark green Avak spine and a dark red Komau. I really want the Komau even if it's unofficial, and it also made me wonder, do they have other recolors, such as... I dunno, a white Mahiki? LOL it's cool! What happened about Surge 3.0? Will you make the good version? And another doubt, but not related to the video: are Jawblade swords rubbery (the red part, I mean), or they are just as flexible as Bill Furno ones? I think he needs more green. thank you so much jang i love surge but was real disappointed i'm thinking of doing the same when i get mine. I've seen a Rahaga Kualus with a cool and strange mask... it was cool! -One, and just ONE, kinda Krika white and blue translucent horn. And once again, my doubt: are Jawblade red blades rubbery or they are just Furno 1.0's recolored? hey jang, you can join both cuff ends with a black in connector peice and it halves the size and the cuffs are easier to put in places without touching the ground. and i don't want to be rated as a thief. Don't hate me, but i don't want JANG to get a job at LEGO. What makes JANGs MOCs so good is that his weapons are made of multiple parts. LEGO would say: use this mold, it looks better. So, that is Why I am against JANG getting a job at Lego. How about a sponsorship by LEGO? He advertises the stuff, and they give him a surplus of exclusive parts? dude they dont always do that,they didnt do it with splitfaces shredder claw. ...which is literally two of the sawblade tools attached to a standard socket, and an armor shell attached to the top with a balljoint. Not really. LEGO must follow its own rules, but a MOCist can actually do anything with some parts, and can use Technic parts in a HeroFactory MOC, or HF pieces in a Bionicle MOC, or whatever. LEGO just can "mix" some parts from a theme (Bionicle, Technic...) to other one (Hero Factory, Power Miners...). Comment 19. LEGOJANG lets anyone use his MOCs without permission. He only calls people who steal his pictures that he took and videos that he made. ...Evo was smaller than Surge. -The guy expecting a few people commenting talking about how Evo didn't need it... Those fools. I want to show off one of my own creations that I'm proud of. He's a villan for sure, but I'm not sure of a name for him. How do I go about posting a pic? Maybe you guys can help with a name then. For example, here are some 2.0 hero MOCs. Evo is actually the same size as Surge.